LTS is currently at Valencia > Limited Time Items. 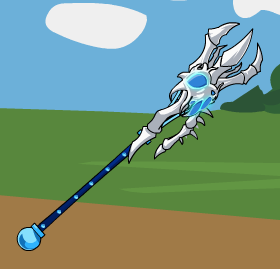 MC Ranged Earth spear. +5 BTH lean. Special is three Ranged hits. +5 additional BTH lean (which stack with the above for +10 total). It inflicts Bleeding on your foe (85/95/6*[hits connected]/3 power). Your foe can resist with a save at a -10 penalty (inflict with VSTAT/LUK, resist with END/LUK). This tome allows one to harvest the eternally changing wind for a variety of spells that will blow your foe away! Foam Finger's Base and Random appears to be way too low for a Melee Weapon, it seems to be based on Magic weapon standards(19-29)[though the info subs for it aren't out yet]. This foam covering for your hand gives off an inspirational aura! The fiery enthusiasm it gives off will inspire your pets, causing them to deal greater damage! *Click to perform a hyper cheer for your pet each turn for 59 SP, making them deal +50% damage! **You get ready to perform a hyper cheer for your pet! *Click to perform a super cheer for your pet and guest each turn for 78 SP, making them deal +25% damage! **You get ready to perform a super cheer for your pet and guest! *Click to perform a normal cheer for your pet each turn for no SP cost, making them deal +12.5% damage! **You get ready to perform a normal cheer for your pet! Melee Fire Fist, so +5 BtH lean and 0.25 base lean. MC effect has 3 modes, none of which affect the weapon's damage itself in any way. First mode is the "free" mode, no SP cost, you just are paying the 5% Melee MC effect to have your pet deal +12.5% damage, 5% Melee /0.4 = 12.5, the same effect if applied to a guest would be 5 / 0.6 = 8.33... Second mode has the player pay SP equivalent to 15% Melee per turn (SPCost1) to have the pet deal a further +37.5% damage, for a total of +50% damage. The final mode has the player pay SP equivalent to 20% Melee per turn (SPCost2) to have the pet deal a total of +25% damage (5% Melee MC and 5% Melee in SP cost) and the guest deal +25% damage (15% Melee in SP cost, since every 5% Melee is = to +8.33...% guest damage). The SP costs are deducted at the end of the player's turn, if the player doesn't have enough SP, it will automatically shift to the "free" mode that has the pet just deal +12.5% damage. If the battle ends and the pet and/or guest didn't get a chance to attack after the cost was paid, then their portion of the SP cost will be refunded. So for the 2nd mode if the player or guest defeats the mob, you get a full refund of the SP cost. For the 3rd mode, if the player defeats the mob, you get a full refund, but if the guest defeats the mob, you only get 1/4 of the listed SPCost2 refuned, since the guest attacked, but the pet did not. 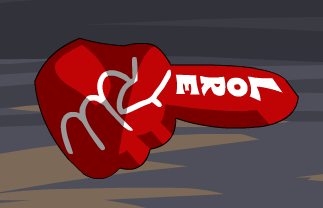 Is the foam finger's base and random deliberately made to be that low? Isn't 19-29 more like the base and random of a magic weapon instead. I thought a PLv153G weapon with 19 base would have 26 random making it 19-45? The sum of a physical weapons base and random shouldn't go below 32 right since that's where the base and random would meet if ever? ^ it was corrected last night, the subs just need to be updated to reflect that. so the new base and random of foam finger now is? Nevermind, it's 26-38 now, just saw it for myself. Magic Wind/Darkness/Light Staves, all have no lean of any kind, basically clones of each other. MC effect is pretty basic, boosts damage of spells of their corresponding element. 5% Melee MC = +12.5% spell damage. Since spells get cast twice/battle, so the 50% Melee from 10 turns of weapon smacking means the spells need to deal +25% Melee damage each. On a Magic weapon it means the spell deals +9.375% damage, so that's simple enough. Magic Light Staff, no lean of any kind, and no special. MC effect attempts to inflict a (15.76*Hits/Attempts)% Daze for 4 turns when the user casts a spell that deals Light damage. For multi-element spells, it only counts Light attacks for the Hits bit, but all attempted hits are counted for Attempts. Is a 50% save, inflict with INT/LUK and resist with CHA/LUK. Melee Darkness Sword, katana, so like a dagger has +3 BtH lean and a base lean, 0.25 in this case. MC applies to the special, attempts to inflict Choke (weapon is a mini portal to space, special opens one around the foe and their air gets sucked away). 5% Melee MC on a 20% special means 25% Melee, so 50% save doubles again to 50% Melee, special will deal two hits, so have it last Hits turns and lower mob damage by (25/(1.4*0.85) = 21*MobDarkRes%. Inflict with VStat/LUK, resist with END/LUK. 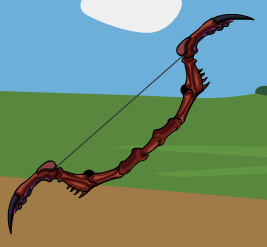 Ranged Energy Bow, no lean of any kind. Has a regular bow special and a 20% proc true special. MC has the true special attempt to inflict an Energy-element Burn on foe, 5% MC on 20% special means 25% Melee, 50% save means now 50% Melee, so have the special attempts 4 hits, so Burn lasts Hits turns and does 12.5% Melee damage per turn. Melee Darkness Sword, no lean of any sort. MC effect is an (8.4*Hits/Attempts*MobsDarkRes)% chance to attempt a 1 turn Paralyse, usual Paralysis stacking and such applies. Inflict with STR/LUK, resist with INT/LUK (is an arcane effect on the sword, but the sword deals melee damage). Melee Dark Sword, clone of the Darkness Dragon Blade, but MC'd so no downtrigger. Just to be sure regarding the Foam Finger. Does Foam Finger affect on healing pets/guests? I mean, when you hold the Foam Finger, will you get more heal from your healing pets/guests? Healing isn't anything special, it's just another element. Finger is not restricted by what element it boosts, so yes. Melee/Magic toggle Fist and Ranged Gun. MC effect is similar to the shield, except you pay 15% Melee in SP to deal +15% damage with weapon and spell attacks, boost is /0.75 for Magic attacks and /2 for spells. On the gun this changes the special animation, on the claws it gives a different idle animation. None have a special, gun is neutral lean and +6 BtH lean, claws have a 0.25 base lean and a +5 BtH lean. Priced like the shield, is misc + weapon compression, basically. These claws rarely miss the mark and can strike for either Melee or Magic damage. With a little extra energy, you can make every hit count. *Click to swap to Melee/Magic damage! **Your weapon deals <> Melee damage! ***Your weapon deals <> Magic damage! #Click to activate hyper mode on your claws, boosting weapon and spell damage! Costs <> SP. Looks like the paragon ice blade has the element images backwards. It seems to use the ice image in darkness mode and the darkness image in ice mode. Seems to be true for both melee and magic. Have the info for Mirror Caladbolg and Ragnarok been posted yet? Are the Snugglefest Foam Fingers and their effects able to increase the boost of pets/guests like poelala/dunamis? That is a bug I've found to be recreateable if you toggle fast enough. I use it to have the runes on my sword while still having it in melee mode lol. Big Image Dump coming through. 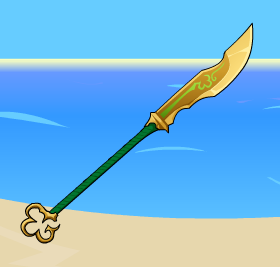 A Ninja weapon forged with Leprechaun magic, this weapon strikes with greatly increased accuracy. A folding fan imbued with Leprechaun magic, this weapon is used by Ninja on covert missions and strickes with greatly increased accuracy. 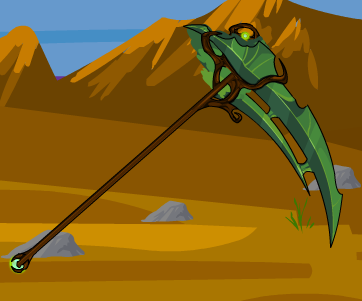 A polearm imbued with Leprechaun magic, this elegant weapon strikes with greatly increased accuracy. This spoon commemorates the time we fought off Sham and the Ninjachaun army. This spoon will attack with a blast of shadow-y rainbows, and for Guardians has a boosted Lucky Strike rate for weapon and spell attacks! Crafted from Fire Mantik parts, this longbow fires powerful but hard to aim shots. Guardians can bring out more of its power, making its aerial barrage attack deal even more damage! 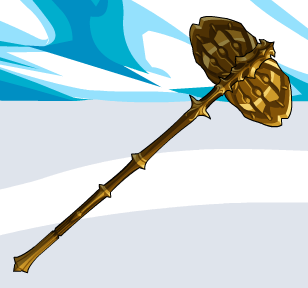 This now inanimate brazier can still shoot blazing fireballs into the sky that will then rain down on your foe! If you're a Guardian, the fireballs burn even hotter, dealing more damage! 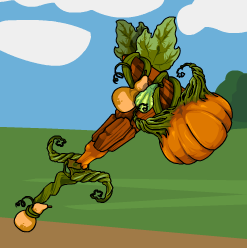 This pumpkin-shaped hammer is filled with spicy seeds that it can fire at your foe! Guardians get extra spicy seeds that do more damage! I've noticed that the previous hunt weapon images were gone so I have re-uploaded them below. MC on the ninja weapons is *1.5 LS rate. They also all have fully accurate leans. Melee «Element» weapons. No proc, so +9% damage. Gains +5 BTH and deals *85/90 damage. See Shuriken for MC. Same as above, but scales to your guardianlvl. Has a 0.25 BRLean. 20% proc Ranged «Element» spear. Gains +5 BTH and deals *85/90 damage. Special is 3 hits, ranged. See Shuriken for MC. Spoon does *1.375 LS rate on weapon attacks and spells, but only for Guardians. From testing, it seems to only boost Dark spells LS's, not 100% sure though. This heavy carrot won't give you better eyesight, but you can take a bite of it after each turn to heal a percentage of your max HP! 150G is healing 19 or 20 with 4695 max HP so ~0.4% health healed per turn. I believe we need an info sub for Winds of Change tome from the fate of the uncreated war. info subs for the new LTS items please? A replica of the hammer wielded by Zabura the Righteous, this weapon is perfect for Paladins with great physical strength! Focusing power into it can unleash a powerful pillar of light that can blind foes! 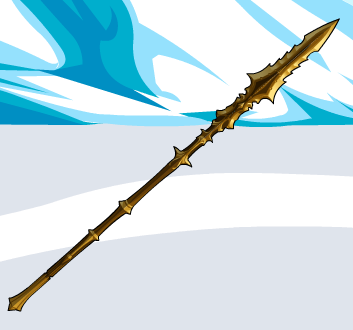 A replica of the spear wielded by Zakiya the Faithful, this weapon is perfect for Paladins with high dexterity! Focusing power into it can unleash a powerful pillar of light that can blind foes!